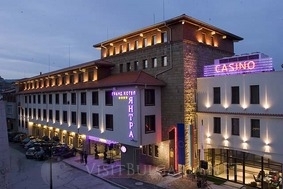 Location: The four star Yantra Grand Hotel is situated in the old picturesque town of Veliko Tarnovo. It reveals unique views to fortress of Tsarevets and the architectural preserve Arbanasi. Hotel Facilities: Yantra Grand Hotel offers to its guests cozy apartments, double and single rooms, restaurant, conference room, also SPA & Wellness centre with modern equipment. The hotel has a nice lobby-bar with a fireplace, Viennese confectionery, exquisite VIP room, art-gallery, electronic casino and tourist office. The restaurant offers to the guests a magnificent view of the Tsarevets hill and its show “Sound and light”. The restaurant also has a unique barbeque, where the skewers are rotated by a water-driven wheel. The hotel has one conference room with modern equipment /100-130 seats/ with the option of simultaneous translation and multimedia presentations plus 3 small comfortable rooms with 8 seats each. The SPA & Welness centre offers volcanic stone and chocolate massage procedures, magic honey body and cosmetic face therapies, and many other services to fully relax the guests of the luxorious hotel. Room Facilities: Yantra Grand Hotel has 29 standard double rooms with a view over the old part of Veliko Turnovo, 23 luxurious double rooms with view over the historical hill Tsarevets, and 8 single rooms. Every room is equipped with TV, telephone, Internet connection, mini-bar, bathroom with a bath tub or shower cabin.